The cemetery's first superintendent, horticulturist Frank Eurich (1876-1900), created a mixture of rare and common, national and international flora. The one hundred or so species of trees at Woodlawn represent an excellent mix of varieties found in a typical Eastern deciduous woodland area. In the spring the grounds of Woodlawn are in bloom with thousands of flowering trees and shrubs - pinks, mauves, yellows and whites. In the fall, Woodlawn is a blanket of autumns colors of red, gold, russet and yellow. 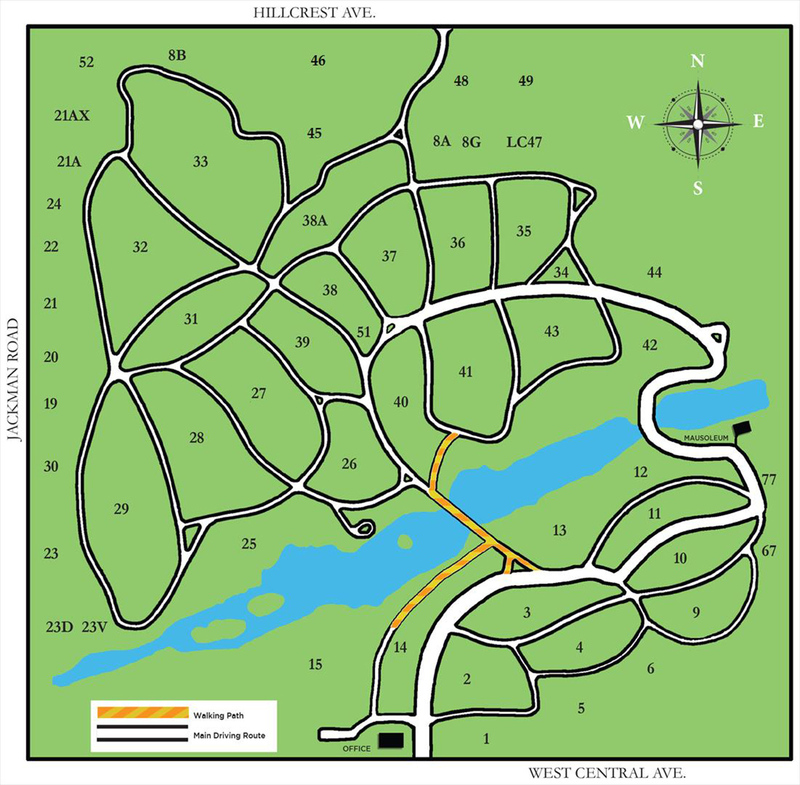 Visitors are invited anytime to walk the grounds witness our spectacular arboretum first hand. 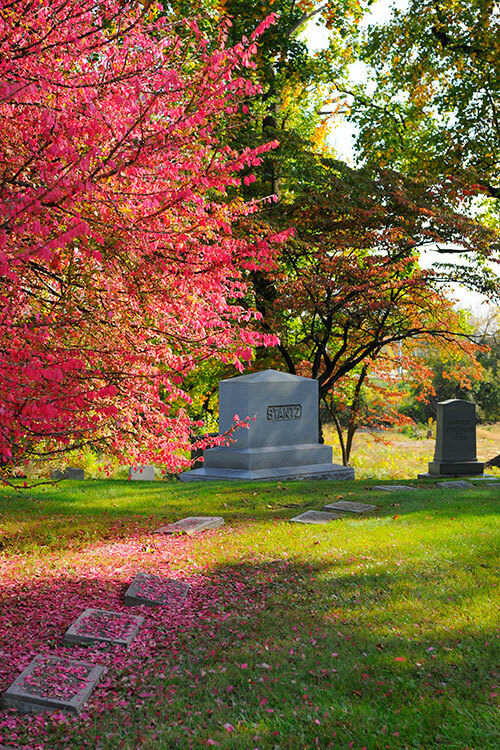 An opportunity for a guided tree walk occurs each May and October during our Tree and Tombstone Tours. Woodlawn has received Level II Accreditation from the ArbNet Arboretum Accreditation Program, the only global initiative to officially recognize arboreta at various levels of development, capacity, and professionalism. Our initial step of a proactive program within an overall plan for the arboretum has been implemented. This year, we have been able to provide for the removal of 75 trees and a complete inventory of our collections has begun. 50 species of trees are now labeled with common and botanical names as well as a QR code for additional information. A grove of 19 Ohio Buckeye trees located along the Jackman Road side of the cemetery. A pleasant mix of western conifers including Douglas Fir, Blue Spruce, Norway Spruce, White Pine, Limber Pine, Austrian Pine and Scots Pine. Many of these specimens are located at either end of the historic Main Bridge. European Alder trees located along the lake. These old trees are among the earliest planted at Woodlawn. Alder seedlings can be found in abundance downstream along the creek flowing. A true Red Buckeye tree located near the center of Section 10. Two substantial Yellowwood trees remain in Section 19 along Jackman Road. They are noted for their extreme fragrance when in bloom in late May and early June. Manchurican maple, Devil’s walking stick, Sugar hackberry, Bunge spindletree, Japanese larch and White basswood. Woodlawn hosts a great variety of well-known common trees as well, including: Yellow Poplar or Tulip Tree, Sweet Gum, Sugar Maple, American and European Beech, Red Maple, White Ash, Green Ash, Dogwood, Redbud, Star Magnolia, Canadian Hemlock and European Larch. Hours: Summer: 8 a.m. - 6 p.m. • Winter: 8 a.m. - 5 p.m.